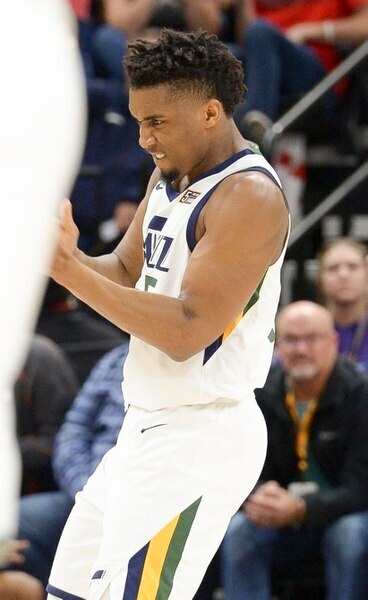 (Leah Hogsten | The Salt Lake Tribune) Utah Jazz guard Donovan Mitchell (45) celebrates his 3-point bucket. The Utah Jazz lead the Golden State Warriors 62-33 during their game, Tuesday, April 10, 2018 at the Vivant Smart Home Arena. 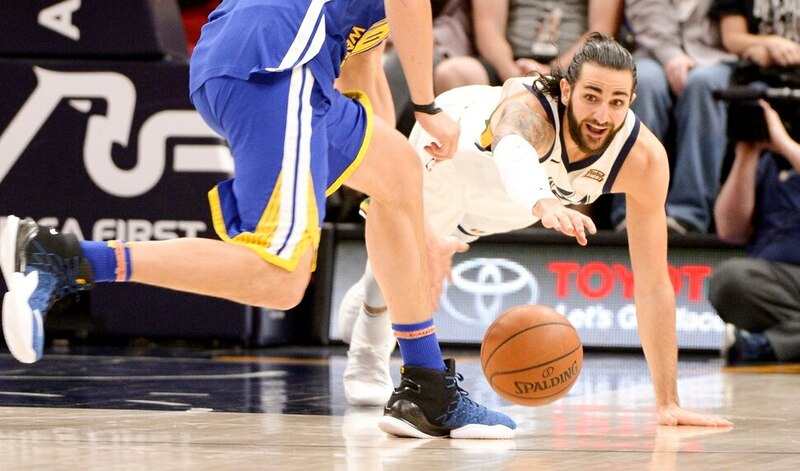 (Leah Hogsten | The Salt Lake Tribune) Utah Jazz guard Ricky Rubio (3) battles Golden State Warriors guard Klay Thompson (11) for possession. The Utah Jazz lead the Golden State Warriors 62-33 during their game, Tuesday, April 10, 2018 at the Vivant Smart Home Arena. (Leah Hogsten | The Salt Lake Tribune) Golden State Warriors guard Klay Thompson (11) pressures Utah Jazz guard Donovan Mitchell (45). The Utah Jazz lead the Golden State Warriors 62-33 during their game, Tuesday, April 10, 2018 at the Vivant Smart Home Arena. (Leah Hogsten | The Salt Lake Tribune) Utah Jazz forward Jae Crowder (99) with the bucket. The Utah Jazz lead the Golden State Warriors 62-33 during their game, Tuesday, April 10, 2018 at the Vivant Smart Home Arena. 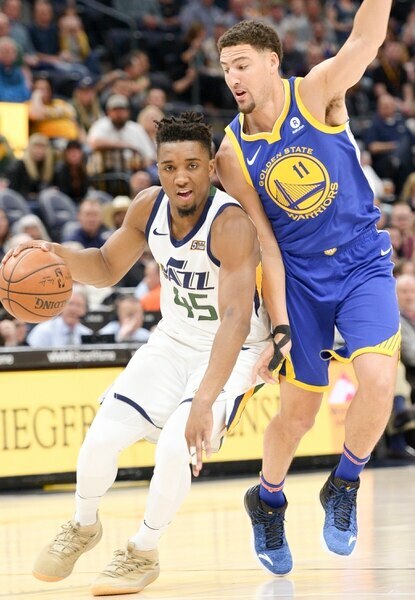 (Leah Hogsten | The Salt Lake Tribune) Utah Jazz guard Donovan Mitchell (45) shoots past Golden State Warriors guard Klay Thompson (11). The Utah Jazz lead the Golden State Warriors 62-33 during their game, Tuesday, April 10, 2018 at the Vivant Smart Home Arena. (Leah Hogsten | The Salt Lake Tribune) Utah Jazz guard Donovan Mitchell (45) had 15 points in the first half. The Utah Jazz lead the Golden State Warriors 62-33 during their game, Tuesday, April 10, 2018 at the Vivant Smart Home Arena. (Leah Hogsten | The Salt Lake Tribune) Utah Jazz guard Donovan Mitchell (45) congratulates Utah Jazz center Rudy Gobert (27) on his aggressive play. The Utah Jazz lead the Golden State Warriors 62-33 during their game, Tuesday, April 10, 2018 at the Vivant Smart Home Arena. (Leah Hogsten | The Salt Lake Tribune) Utah Jazz guard Donovan Mitchell (45) grabs the steal from Golden State Warriors forward Draymond Green (23). The Utah Jazz lead the Golden State Warriors 62-33 during their game, Tuesday, April 10, 2018 at the Vivant Smart Home Arena. (Leah Hogsten | The Salt Lake Tribune) Utah Jazz forward Royce O'Neale (23) with the bucket. The Utah Jazz lead the Golden State Warriors 62-33 during their game, Tuesday, April 10, 2018 at the Vivant Smart Home Arena. (Leah Hogsten | The Salt Lake Tribune) Utah Jazz guard Dante Exum (11) slips past Golden State Warriors center JaVale McGee (1) and Golden State Warriors guard Shaun Livingston (34). The Utah Jazz lead the Golden State Warriors 62-33 during their game, Tuesday, April 10, 2018 at the Vivant Smart Home Arena. (Leah Hogsten | The Salt Lake Tribune) Utah Jazz guard Dante Exum (11) with the dunk. The Utah Jazz defeated the Golden State Warriors 119-79 during their game, Tuesday, April 10, 2018 at the Vivant Smart Home Arena. (Leah Hogsten | The Salt Lake Tribune) Utah Jazz forward Jonas Jerebko (8) celebrates his 3-point bucket. The Utah Jazz defeated the Golden State Warriors 119-79 during their game, Tuesday, April 10, 2018 at the Vivant Smart Home Arena. (Leah Hogsten | The Salt Lake Tribune) l-r Utah Jazz guard Donovan Mitchell (45), forward Royce O'Neale (23) forward Jae Crowder (99) and forward Derrick Favors (15) celebrate teammate Jonas Jerebko's 3-point bucket. The Utah Jazz defeated the Golden State Warriors 119-79 during their game, Tuesday, April 10, 2018 at the Vivant Smart Home Arena. (Leah Hogsten | The Salt Lake Tribune) Utah Jazz center Ekpe Udoh (33) pulls in the rebound The Utah Jazz defeated the Golden State Warriors 119-79 during their game, Tuesday, April 10, 2018 at the Vivant Smart Home Arena. (Leah Hogsten | The Salt Lake Tribune) Utah Jazz guard Donovan Mitchell (45) signs autographs at the end of the game. The Utah Jazz defeated the Golden State Warriors 119-79 during their game, Tuesday, April 10, 2018 at the Vivant Smart Home Arena. (Leah Hogsten | The Salt Lake Tribune) Fresh off the links at the 2018 Masters, Tony Finau was seen in the crowd. The Utah Jazz defeated the Golden State Warriors 119-79 during their game, Tuesday, April 10, 2018 at the Vivant Smart Home Arena. (Leah Hogsten | The Salt Lake Tribune) Utah Jazz guard Donovan Mitchell (45) had 22 points and 3 rebounds. The Utah Jazz defeated the Golden State Warriors 119-79 during their game, Tuesday, April 10, 2018 at the Vivant Smart Home Arena. (Leah Hogsten | The Salt Lake Tribune) Golden State Warriors forward Kevin Durant (35) had 13 points and 4 rebounds during the game. The Utah Jazz defeated the Golden State Warriors 119-79 during their game, Tuesday, April 10, 2018 at the Vivant Smart Home Arena. (Leah Hogsten | The Salt Lake Tribune) The Utah Jazz defeated the Golden State Warriors 119-79 during their game, Tuesday, April 10, 2018 at the Vivant Smart Home Arena. (Leah Hogsten | The Salt Lake Tribune) Golden State Warriors forward Kevin Durant (35) pressures Utah Jazz forward Jae Crowder (99). The Utah Jazz defeated the Golden State Warriors 119-79 during their game, Tuesday, April 10, 2018 at the Vivant Smart Home Arena. What Donovan Mitchell wore to Vivint Smart Home Arena on Tuesday is bound to catch his attention. “Adidas, we just wanted to have fun with it,” Mitchell said after Tuesday’s rout of the Warriors. “That’s all it is. Just having fun and enjoying it. I’m blessed to be in this spot, and my team in this consideration, but why not have fun with it? Mitchell has been deflective about commenting about the race, saying the award would mean less to him than winning games in the playoffs. But the sweatshirt, custom-made for him by Adidas, was the latest salvo in a war of words about whether Simmons or Mitchell deserves the award in a heated race. Simmons has been the favorite since the season began, averaging 16 points, eight assists and eight rebounds for the 76ers, who recently passed the 50-win mark. Mitchell’s case has grown during Utah’s 28-5 run to the playoffs in the West, during which he’s become the first rookie to lead a 45-win team in scoring since Carmelo Anthony in 2003 with the Denver Nuggets. While Simmons technically is an NBA rookie, some critics have decried his case by noting he was drafted in 2016 and spent last season out with injury. It doesn’t change the fact that he’s eligible to win Rookie of the Year, but players such as Golden State’s Draymond Green give more credit to Mitchell. Philadelphia is similarly bullish about Simmons’ candidacy. Simmons told ESPN that he thought the award was “100 percent me.” Coach Brett Brown told local media on Tuesday he didn’t think the race was particularly close. Vivint Smart Home Arena isn’t exactly known for its celebrity sideline section, but two of the biggest athletes in the state came out to Thursday’s game. Olympic figure skating star Nathan Chen, who told the Tribune back in February that he is a lifelong Jazz fan, was in attendance and briefly did a Q&A on the Jazz’s social media accounts. Tony Finau, fresh off a top-10 performance in the Masters last weekend on a bum ankle, also was spotted in the sellout crowd.